We spent 50 hours researching and testing 10 different types and brands of baby pain reliever and found that effectiveness, ease of administration, and safety were the most important factors for consumers who were shopping for baby pain reliever. Advil Infants’ Fever Reducer/Pain Reliever scored high marks in all categories and is our overall top pick. Children’s Advil can bring down a fever quickly and works for up to 8 hours. It is a parent favorite because it contains no dyes, no alcohol, and lasts longer than Tylenol does. Advil infants fever reducer can be used with babies 6 months to 24 months. These drops come with a syringe so you can easily get the precise dose for your baby. No parent wants to see their child not feeling well or running a fever. There are many different types of pain relievers on the market for babies but it can be scary trying to figure out which ones are safe for young ones. With all of these choices to sort through it can be overwhelming to decide which one is best, which is safest, and if your child will get the pain or fever relief they need. We have provided you with some tools that will make sorting through the different over-the-counter pain relievers much less stressful. First off, we have taken three top-rated pain relievers and reviewed them below so you can become familiar with their benefits, ingredients, and reputations. Any one of these three selections has been used successfully by parents to help relieve pain and fever in their children. If you are looking for a fast solution to this need, any one of these three products will work. We have also included a buying guide that will help you understand baby pain relievers so you can determine which are good and safe for your baby and which you should avoid. You’ll also learn about ingredients and what to look for in a pain reliever. This information will allow you to make a confident decision on the right fever reducer for your needs. Advil is a well-known and trusted name in pain relief and that includes for infants as well. This infant fever reducer and pain reliever comes in concentrated drops that can work up to 8 hours and reduces fevers and pain quickly; much quicker than the competition. This effective infant pain reliever is alcohol-free, pain-free and works for ages 6-23 months of age. The company provides a convenient dosage syringe and dosing chart so you can give them the right amount for their age and weight. 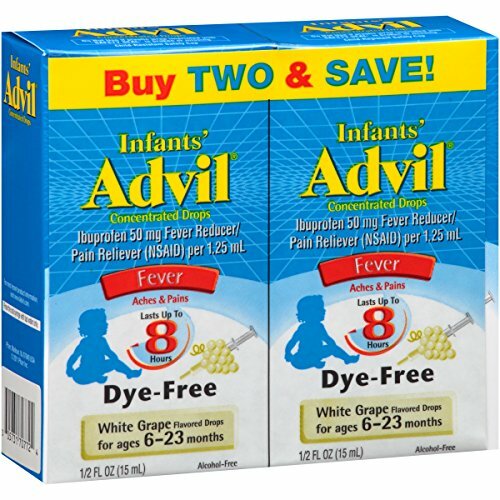 If you’re looking for a reliable pain reliever for your little one, Advil infants’ fever reducer and pain reliever is a great choice and one made by thousands of parents. The two-pack is convenient and provides you with one for now and one to keep as backup. 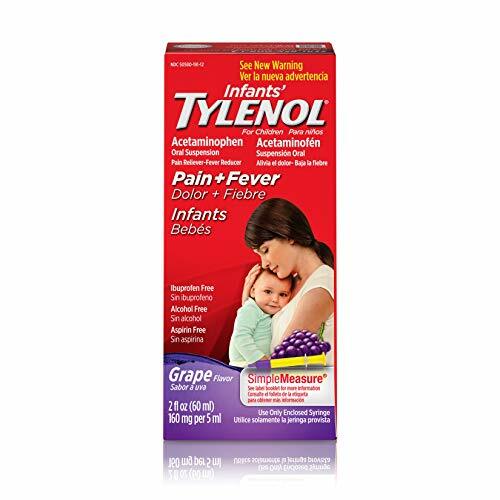 Tylenol is a household name with most people and is often used as a reference for acetaminophen although it is just one brand of this fever reducer and pain reliever. These Infants’ Tylenol oral suspension drops will help relieve the aches and pains and fever in children and has been the most often recommended brand by children’s doctors for more than 20 years. One of the benefits to infant Tylenol is that your little one can take it without it upsetting their stomachs. If your baby is under two make sure that you have purchased the infant drops that are typically for 6 months to two years or you call your pediatrician first to ensure the proper and safe dose for your little one. Parents can choose from grape and cherry flavors that children usually like without too much fuss. There is a dosage syringe included for accurate dosing and a chart that will give the recommended amounts dependent upon the age and weight of your child. Motrin is another widely known name in pain relievers for children and adults. This Infants’ Motrin concentrated drops will relieve your baby’s aches and pains that are due to colds, sore throats, allergies, fevers, teething and headaches. The active ingredient in Infants’ Motrin is ibuprofen. This product is for use with infants 6-23 months of age and can provide up to 8 hours of relief. Motrin products have a history of providing relief effectively from fevers and pain for the whole family. The Motrin Infants’ drops are available in berry flavor as well as a dye-free berry flavor. The included dosing chart helps parents administer the proper dosage for their child based on age and weight. There is a dosage dropper included with the medicine for accurate dosing. These three top-rated baby pain relievers are all high quality, well-known products that parents have used and trusted for decades. All of them offer drops for infants up through toddler and there are pain reliever products for the rest of the family as well. Taking the time to ensure you have a safe product to help bring down your baby’s fever and aches and pains will offer the kind of peace of mind a parent wants. Having the right products on hand if your baby is not feeling well can take some of the stress off since you will feel confident that you have what you need to make your baby feel better. Once you are ready to purchase an infant pain reliever, consider starting with one of the three top-rated infants’ pain relievers we have featured above that have proven track records and the kind of reputation you want to see in a child’s product. If none of the top three reviewed above is what you want, we have added 7 more selections that you can consider as well. One of the most important things about baby pain relievers is knowing when to give them. It can be complicated, especially if you have a baby too young to really tell you what is going on or where it hurts. Not every tiny thing needs a pain reliever but there are some definite times that giving baby pain reliever to your baby is necessary. Below are some of the common symptoms that could indicate it’s time for an assessment as to what might be going on. Fevers are one of the most common indicators that something is wrong. It is the body’s way of fighting something amiss in the system. Some, very low grade fevers do not require a fever reducer at all. It is very important to consult your child’s doctor whenever you are concerned about your child being sick. If the fever is not low-grade or is causing your child to be uncomfortable, giving them a baby pain reliever is appropriate. Pain relievers come in a variety of different forms. We have listed these forms below so you understand the differences between them. Suspensions – Suspension pain relievers are thicker than other types because the active ingredient in suspension liquids is held by an agent that suspends them. They should be shaken well before administering. Drops – Pain reliever drops are good for young babies and children due to the fact that the dosage can be measured more accurately, making them safer for young children. It is also easy to give medicine to young children in this form. Chewable tablets – Pain relievers in this form are perfect for children two and up. Make sure that this is the proper age range by reading the box. If your child resists chewing up the tablets on their own they can be crushed and mixed with jam or honey so they are accepted more easily. Suppositories – If your child is vomiting a lot and can’t keep any oral medication down, a suppository is a good solution. Although they may not be very pleasant to use they work quickly and your child doesn’t have to worry about keeping them down on an upset stomach. Elixirs and syrups – These thinner liquids have the active ingredients already dissolved in the liquid. Syrups and elixirs have an added agent that masks the bitterness and makes them more palatable to little ones. Effervescent tablets – These kinds of pain relievers can be used by children 7 and up (read the box for specific age requirements) and should not be given to babies and young children without the express instruction of a pediatrician. When you start shopping around for the right baby pain reliever for your needs there are several things you want to look for. We have listed these important factors below. Buy the right product for the age child or children you have. Age guides are printed on the back of the package. Look for over-the-counter suppositories for times when your baby or child can’t keep anything down due to vomiting. If your baby has a form of pain reliever they take easier than others keep that type on hand. There is no point in trying to force another form down them when they already don’t feel well. The only exception to this is the suppositories but those are best used when the child or baby has a stomach bug. Check ingredients if your child has allergies or ingredient intolerances. Some children have reactions to the dyes used in pain relievers and other medicines. They do have dye-free versions available. Make a point of knowing your child’s allergies and read those labels. Flavors count. Medicine is medicine and not supposed to taste like candy but flavorings were added to many children’s medicines to prevent the child or baby from completely refusing it due to the bitter taste many can have. Look for pain relievers that offer measuring droppers or syringes when you are purchasing for a baby or young child. It makes them a lot easier to administer. The prices of baby pain relievers can range from a couple of dollars to as high as 10 or 15 dollars depending on the brand and how big the bottle is. Generic versions of pain killers exist and are usually much cheaper than the name brands. If price is an issue for you there are many products for you to choose from. Some parents believe that the name brands are the best to get and refuse to use store brand products but one thing to do is compare the labels and see if they have the same ingredients in the same concentrations and what other ingredients might be present. If you are going to compare prices make sure you are comparing two products that offer the same amount of product to get a true idea of what the cost difference is. It is more important to have a baby pain reliever you trust so if you are hesitant about using generics you will be better off going with what you know and are comfortable with rather than worrying about saving a few dollars. Each over the counter baby pain reliever contains certain active ingredients that allow them to work on certain symptoms and problems. It is to your benefit to understand some things about active ingredients and what to look for when you are shopping for pain relievers. Ibuprofen – There are several popular brands of ibuprofen on the market including Panafen and Nurofen. Ibuprofen is used as an anti-inflammatory and fever reducer. Some of the common side effects include upset stomach and nausea. If your child is dehydrated from lots of vomiting or diarrhea it is not a good idea to give ibuprofen. To reduce the potential side effects of ibuprofen give to your child with food. If your child suffers with asthma ibuprofen should not be given unless you have consulted with a pediatrician first that knows the child’s history. Paracetamol – Popular brands of Paracetamol include Panadol, Dymadon, and Herron. This ingredient reduces fevers and pain associated with immunizations, headaches, fevers, and teething and toothaches. It is very important that you read the label of any pain relievers containing paracetamol to ensure that the child gets the correct dose. Aspirin – Children under the age of 16 should not have aspirin due to the fact that it has been linked to the rare Reye’s Syndrome. Other names for aspirin include salicylate or acetylsalicylic acid and are found in some over the counter pain relievers. Always check your ingredients if you try a new type of pain reliever. Codeine – Codeine is NOT an over the counter medication and is not recommended for babies under 1 year old. It is a common choice for dealing with pain from intense earaches, post-op pain, fractures and other more severe injuries. Short-term use of codeine is recommended since it can cause addictions and should never be administered without the care and prescriptions of a doctor. We have provided some tips for you to follow below when it comes to giving baby pain reliever to your little one. These tips are all focused on safe practices and are important for you to be aware of and follow. Make sure that you use the correct dose, product, and strength for your child’s weight and age. The packages of these pain relievers have dosage information on the back so you understand how much your child should receive. Different types of pain relievers will have different strengths of the active ingredients depending on what they are. Always read the package before purchasing a pain reliever to know what it is that you are purchasing. Do not give a baby pain reliever to your child for longer than 48 hours unless it has been directed by the child’s pediatrician. Use the dosage cup or syringe that is provided in the box with the medicine. These cups and droppers and syringes make giving the child the pain reliever much easier. Keep all medications, even those for children out of their reach. Just because it is a medicine for a child doesn’t mean it is safe to take large doses of. It is still medicine. Check all the labels of the medicines you give your baby or child and make sure you are not doubling up medication accidentally. For example, if you child has a cold and you give them cold medicine and then give them a fever reducer on top of that, you can easily give them double doses of the pain reliever since most cold medicines contain acetaminophen. If you do not know something regarding a baby pain reliever you are considering; ask your child’s doctor do not try to just figure it out. You can also ask your pharmacist. With all of the different baby pain relievers on the market it can get quickly overwhelming trying to figure out which one is the best one for your baby. With the research and testing we conducted we determined three of the top-rated baby pain relievers and provided you with reviews of those three products. Those reviews are designed to give you detailed information on each of the top-rated products so you can determine which one fits your budget, needs, child’s preferences, and age. All babies and children need a pain reliever at some point. Over the counter pain relievers for babies are meant to handle the more minor things not serious injuries or severe illnesses. If there is ANY question in your mind as to how seriously sick your child is it is better to get on the phone with your doctor than take a chance. They will tell you based on your description of what is going on, whether over the counter baby pain reliever is okay or they need to be seen. The buying guide you have just completed was written to provide you with the information you need to sort through the different baby pain relievers and determine which one will provide your baby with fast, safe relief from minor aches and pains and fevers. This information, along with important safety information when giving pain relievers, will help you feel more confident about understanding what each type of pain reliever offers and how to match that with your child’s age, allergies if any, weight, symptoms, and tastes. This confidence will give you the ability to make the decision that is right for your baby’s health.